Staff photo by Tim Barber/Chattanooga Times Free Press - Feb 27, 2013 - Work on the Chickamauga Lock is stagnant in this February 27 view below the Chickamauga Dam. Nearly four years after work was suspended on one of Chattanooga's biggest building projects, construction crews were back on the job Monday, working to build a new and bigger lock at the Chickamauga Dam in Hixson. As U.S. Rep. Chuck Fleischmann, R-Tenn., and Nashville district officers from the Army Corps of Engineers watched across a canal, workers from Rembco Geotechnical Contractors began drilling into the bedrock of the Tennessee River to shore up the coffer dam in which the new lock will be erected over the next six years. The $3 million contract represents the first sign of major work toward the new lock since funding for the inland waterways project ran dry in 2012. Although the existing 76-year-old lock is crumbling and requires aggressive maintenance to stay in operation, funding for a replacement lock has been crowded out by other major projects in Ohio and Pennsylvania. Fleischmann, who helped push through both a change in the funding formula and an increase in the fuel tax on barges to increase available funds for the Corps, heralded the restart of work as "a great day for the great state of Tennessee. "When I was elected to Congress, I said I wanted to go to Washington to fix things that were broken," Fleischmann said. "Little did I know that practically on my first day on the job I was informed that the Inland Waterways Trust Fund was broken and that the construction on the new Chickamauga lock was going to be halted." The U.S. Army Corps of Engineers, which took over the TVA-built lock two decades ago, spent $182 million from 2004 to 2012 to design the new and bigger lock, reroute roads and streams to accommodate construction and build a coffer dam in which the new lock can be constructed. But to finish the new lock will require more than $600 million of additional funding, even after the $3.1 million provided last year and the current budget of $29.9 million. The Senate Appropriations Committee last week agreed to provide another $37 million for the project next year, and U.S. Sen. Lamar Alexander, R-Tenn., vowed Monday to do what he can to ensure the project gets increased funding for completion. "I will push to continue this support so there will be enough funds to finish construction of a new Chickamauga lock," Alexander said. The new 110-by-600-foot lock would allow six barges to lock through the Chickamauga Dam at a time. The current lock, which measures only 60 feet wide and 360 feet long, can handle only one conventional-sized barge at a time. As construction costs have risen and barge usage declined at the Chickamauga lock, the benefit-to-cost ratio of the new lock has not proven sufficient to be included in the Office of Management and Budget spending proposals under the Obama administration. But Congress has increased funding for the Corps' civil works division by raising the fuel tax on barges and agreeing to shift 85 percent of the costs of finishing the Olmsted Lock and Dam on the Ohio River to the general fund, rather than the Inland Waterways Trust Fund that is equally funded by general taxpayer funds and tax collections from barge operators. 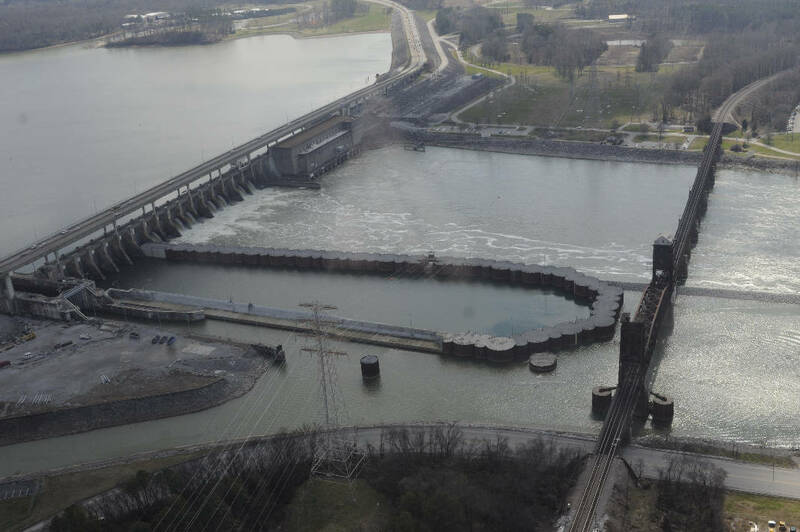 Lt. Col. Stephen Murphy, commander of the Nashville district for the U.S. Army Corps of Engineers, said with adequate funding each year the new lock could be open to barge traffic as soon as 2022 and the approach wall and other final parts of the project could be completed by 2023. The replacement lock at the Chickamauga lock is the fourth highest priority by the Corps, behind only the Olmsted Lock and Dam on the Ohio River, the Monongahela River projects in Pennsylvania and the Kentucky Lock addition on the Tennessee River. While other projects rank higher because of their greater volume of barge shipments, river shippers and boating enthusiasts have lobbied Congress to fund the new lock to avoid a shutdown of the existing lock, which suffers from "concrete growth." A closing of the Chickamauga lock would cut off 318 miles of navigable waters above Chattanooga on the Tennessee River and its tributaries. "We have never allowed that much navigable water to be cut off from river shipments, and we need to work to make sure that never happens," said Cline Jones, executive director of the Tennessee River Valley Association. "It's encouraging to see work resume on the new lock, and we hope Congress will sustain the funding required to finish this project." This story was updated April 25 at 11:35 p.m. with more information.